The old year ended with a new SMART 13 & Under Football champion, Brown Bombers, who edged rivals Hattieville United by the same 1-nil score that they had lost to Hattieville by in the 2012 finals. The championship game, which was preceded by the 3rd place game between City Boys and Ladyville Rising Stars, took place at the MCC Grounds on Sunday, December 22, before the Premier League clash between FC Belize and BDF. Rising Stars defeated City Boys for the 3rd place spot. The SMART 13 & Under championship game was evenly matched, with the decisive goal coming in second half from a long free kick by Tyreek Muschamp, who played sweeper for Brown Bombers in first half, then moved up into the attack in second half. The kids played their hearts out on both sides, but the goal by Muschamp stood up to secure the 1-nil victory and the championship for the Bombers. Immediately following the game, beautiful individual trophies were issued to all members of the 3rd place, 2nd place and championship teams. Big team trophies for 1st , 2nd and 3rd place teams were also received by their respective coaches and captains; individual award trophies were given for outstanding players in the different positions; and there was a special Fair Play trophy for the most deserving team. SMART representative Anthony Mahler congratulated all the participants and thanked all who assisted in the tournament, before handing out the trophies and awards. 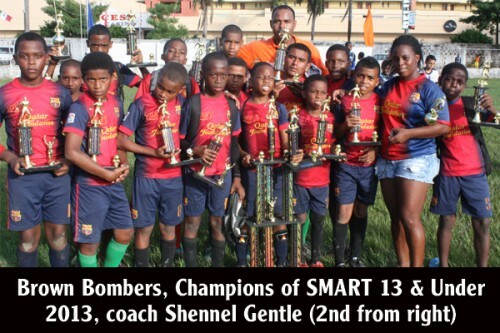 The 2013 SMART 13 & Under Football Tournament Champion is Brown Bombers; sub-champion is Hattieville United; and 3rd place went to Ladyville Rising Stars. Special awards went to: Best Coach – Shennel Gentle (Brown Bombers); Best Goalkeeper – Shaheed Franklin (City Boys); Best Defender – Nelson Tablada (City Boys); Best Midfielder – Mario Rivera (Hattieville United); Best Forward – Lyndon Flowers (Ladyville Jaguars); Most Goals – Sherwin Requena (Brown Bombers); Fair Play – Belize Elementary School; and MVP – Tyreek Muschamp (Brown Bombers).